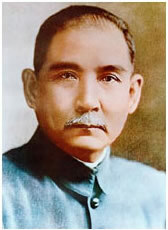 Sun Yat-sen (Sun Zhongshan) (1866-1925) led the revolution to overthrow the last feudal Qing Dynasty (1644-1911) and became the Provisional President of the new Chinese Republic proclaimed in 1911. He is respected as "Father of the Nation" and is also credited with the modernisation of Chinese men's dress. It is said that he instructed Huang Longsheng, a Western-style tailor from Zhejiang Province, to design a suit based on one commonly worn by Chinese men in Japan and south-east Asia. The early form of Sun Yat-sen suit (Qilingwenzhuang) had a closed stand collar and centre-front buttons. The design of the Sun Yat-sen suit changed significantly over the course of some 50 years. A major and lasting change to the design of the Sun Yat-sen suit (Zhongshan-zhuang) was the incorporation of elements of German military dress including a turndown collar and four symmetrically placed pockets. Over time small stylistic changes were made to the design. It is the later style of Sun Yat-sen suit which was further modified and adopted as China's national dress by Mao Zedong after 1949. It is thus also known to the westerners as "Mao Suit" or "Mao Tunic". Long after Sun's death, popular mythology assigned a revolutionary and patriotic significance to the Sun Yat-sen suit, even though it was essentially a foreign-style garment. The four pockets were said to represent the Four Cardinal Principles cited in the classic Book of Changes and understood by the Chinese as fundamental principles of conduct: Propriety, Justice, Honesty, and Shame.The five centre-front buttons were said to represent the five powers of the constitution of the Republic and the three cuff-buttons to symbolise the Three Principles of the People: Nationalism, Democracy, and People's Livelihood.